I've been going for facials since I was 19 years old and was dealing with a horrible case of adult acne. I don't remember when I stopped going for a negative reason, and started going for the pleasure of them. I actually enjoy facials more then massages. I love all the lotions and potions used, the scents, the warm towels, it's heavenly! It is so relaxing to have someone wash your face and apply the various masks and moisturizers while your snug and warm on the table. 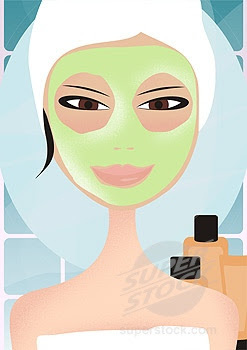 And then there is the head and sometimes leg and arm massage your given while a mask sets. Sometimes I'm so relaxed I have to fight to stay awake. I've had many facials at many different locations, but my absolute favorite place to go is Pure & Simple. A girlfriend told me about this place about six years ago and I've been going there ever since. They use and carry lines of product that are all natural. I have sensitive skin and I like knowing I'm not putting any harsh chemicals on my skin. I've been slowly switching over to using their own reasonable priced line of product, and have noticed the difference in my skin. I try to go for a facial once a month, and it's a monthly pampering ritual I look forward too and enjoy. I've only had two facials. The last one was at the Elmwood. Gord and I went to the Jays game afterwards. My face was beet red and burning. Then it dried out and started peeling. Not a pretty sight :( It took about a month to get back to normal. I know you love them but that was not a good experience for me. Wow Teena, that's awful. Sounds like they used a harsh product on you, I've never had that happen. I've had facials at the Elmwood, but they haven't been very good, and they product push, and I don't like that. Me and my daughter have a mother/daughter night once a month where we give each other facials and watch a chick flick. That's a great night in Tammy!